The Baja Culinary Fest returns to Tijuana for its sixth year from Thursday, October 27 through Sunday, October 30, offering a bustling line up of dinners, seminars, panels, workshops, culinary contests and deliciousness, as well as a free-to-enter tasting showcase with some of Baja's best wine, beer and food vendors at the Tijuana Cultural Center, located only 40 minutes from downtown San Diego. We are raffling off 2 tickets to the kickoff event - Night Of 1000 Flavors - so read on for all the details and be sure to enter. This year's Baja Culinary Fest aims to honor urban street food and will bring together more than 60 culinary presenters and 40 guest chefs from Mexico, Argentina, the United States, and Baja California for four days featuring 30 conferences and demo-cooking classes, culinary contests, and wine paired dinners. The invited guest of honor for this year's festival is Buenos Aires who will fly in three of their top chefs for the 3-day event. 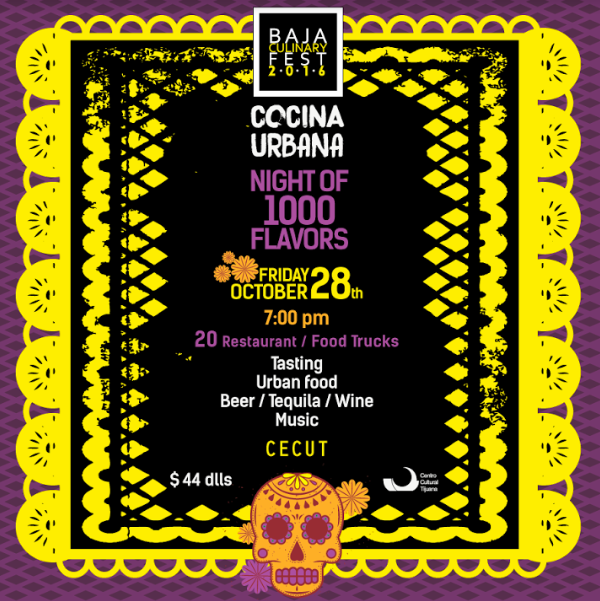 The Fest will begin with an special diner at the Terrace of CECUT, the Tijuana Cultural Center, on October 27, where top Baja chefs will pay homage to Mexico's most popular street food - the mighty taco! More thank 40 vendors, chefs and restaurants will create a flavor fiesta offering a tasty variety of tacos, paired with craft beer, tequila, mezcal and local wine. Our friends at Baja Wine + Food are offering tickets to this event with round-trip transportation for $70 per person. 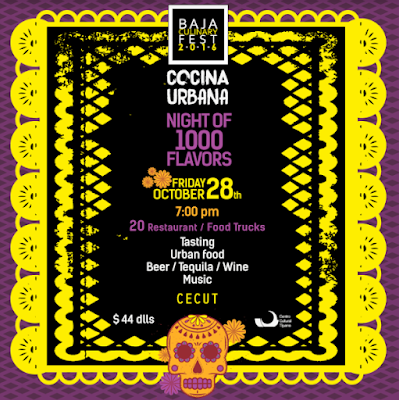 A highlight event during this year's Baja Culinary Fest will be the Noche de Mil Sabores (Night Of 1000 Flavors), taking place on Friday, October 28 at CECUT, where more than 20 different restaurants, food trucks, wineries and breweries will offer guests unlimited samples of top Baja flavors at the cost of only $44 per ticket. There will also be live music, entertainment, Day Of The Dead decorations and more. This year's festival will also offer an inviting lineup of wine paired dinners in collaboration with top Baja and California chefs, hosted throughout Northern Baja, and even one at Bracero in San Diego on October 26. Dinners will take place throughout the festival at Baja restaurants, including Misión 19 (Oct 29), IPAA (Oct 27), Casa Plascencia (Oct 28), Cheripan (Oct 28), ORIX Capital (Oct 27), and Verde y Crema (Oct 27). There will also be a culinary contest hosted at the Tijuana Culinary Art School and a wine tasting contest and tasting, Encopa, at CECUT on October 29, as well as a variety of other workshops and lectures on topics like artisanal beer, wine, traditional cuisine and more. One of the main events of this year's Baja Culinary Fest will honor female chefs. La Cocina que Canta will host a multi-course diner paired with wine on Saturday October 29 at Rancho La Puerta, where 15 Baja women chefs, including San Diegans Flor Franco and Christine Rivera, will prepare a lavish meal with all local ingredients, 1 sommelier and 4 wineries. Tickets to this event start at $95 and can be purchased online. The products and food offered by Baja California’s exceptional culinary talent, it's outstanding wine culture and burgeoning craft beer industry, have made the state one of the most important gastronomic destinations in Mexico. 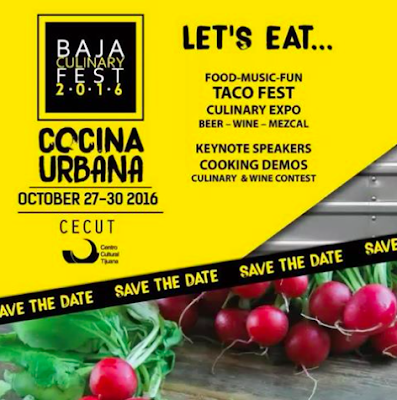 The Baja Culinary Fest will bring together the most prominent creators, restaurants and chefs of the area's culinary movement and shall offer over 3,000 square meters of stands at CECUT in downtown Tijuana throughout the duration of the festival, where guests are invited to come and purchase sample-size portions of a variety of Mexican delicacies, dishes, wines, spirits, beers, and more. Tickets for Baja Culinary Fest main events are currently on sale at Bracero Cucina de Raiz in San Diego's Little Italy and Erizo in Tijuana. 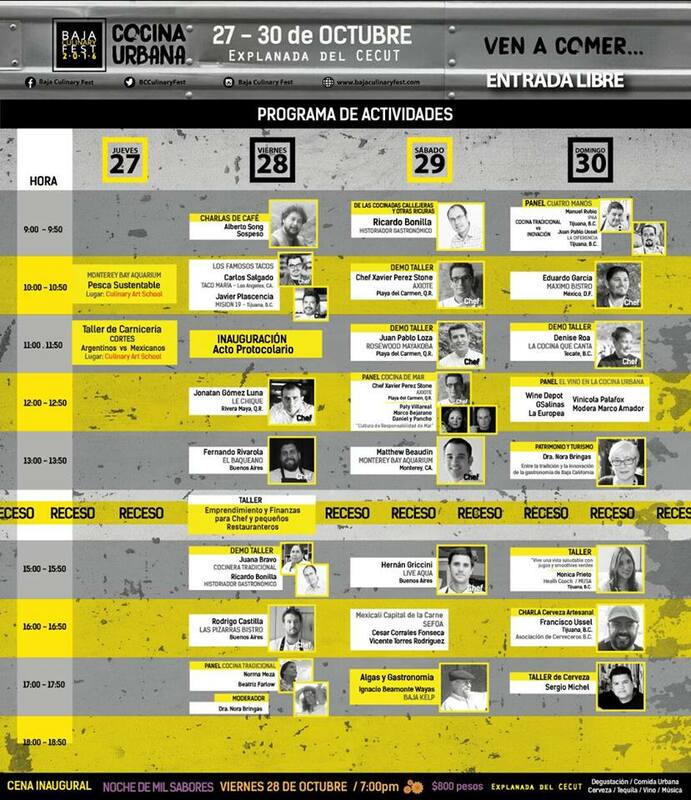 For more information, check out the program of demo lectures, workshops and activities below, visit bajaculinaryfest.com, email info@bajaculinaryfest.com, and follow the event's Facebook page.